Pacific white-sided dolphins are found continuously throughout the north Pacific. 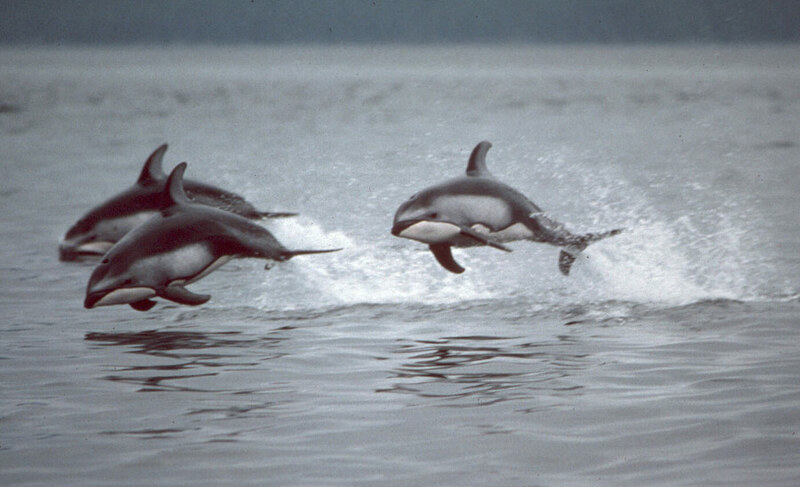 In the eastern part of their range, Pacific white-sided dolphins are found from 20º N to 61ºN. Throughout their range they are found in open-ocean and coastal waters. 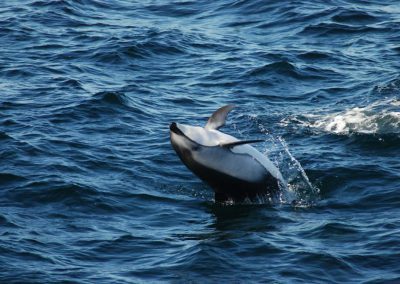 In Canada, Pacific white-sided dolphins were primarily considered a pelagic species, however since the mid-1980s their distribution has shifted and they are increasingly common in coastal waters. Archeological work on 2000 year old middens in the Queen Charlotte Strait uncovered dolphin teeth, demonstrating that this species had long been present on the B.C. coast. They were absent for much of the 20th century and then returned, perhaps encourage by a shift in ocean temperature or prey abundance. 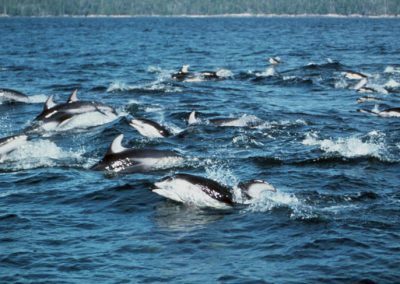 In British Columbia, it is estimated that approximately 25,000 Pacific white-sided dolphins reside along our coast (Williams & Thomas, 2007). 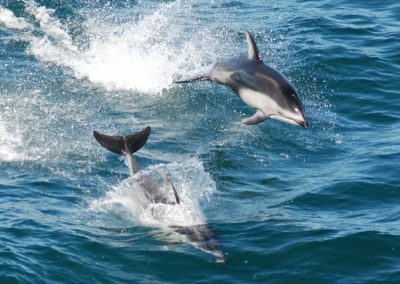 Many assessments from boat-based surveys have been questioned as over-estimates due to the dolphins’ attraction to vessels. 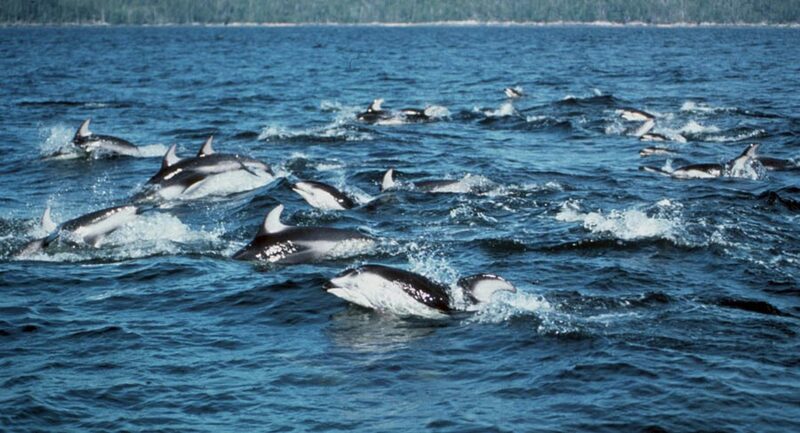 In British Columbia, Pacific white-sided dolphins move inshore/offshore throughout the year. The largest congregation of this species was reported offshore and was estimated to be close to 6000 individuals travelling together. Photo-identification projects are being attempted, but few re-sights of the same animal have been reported. 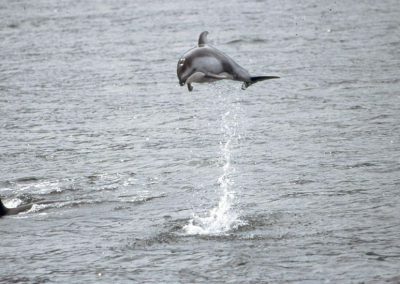 A smaller group of approximately 100-200 dolphins has been seen increasingly in the Strait of Georgia and surrounds which may present an easier opportunity to learn more about this species. Pacific white-sided dolphins are opportunistic predators feeding on over 60 species of fish and 20 species of cephalopods. In BC, they feed on at least 13 different prey species, including salmon, herring, Pollock, shrimp, sablefish, smelt, and squid. They forage cooperatively, though large groups may separate into smaller sub-groups for foraging purposes. These feeding groups have been observed corralling and herding fish in a coordinated fashion. Life expectancy is in the range of 37 to 46 years. Females have a gestation period of approximately 12 months and reach sexual maturity between 7 to 9 years. Males reach sexual maturity around 10 years of age. Most neonates are observed in the spring/summer season and are nursed for 8-10 months. Females appear to have a slow calving interval of 4.67 years. Pacific white-sided dolphins are often reported associating with other species. 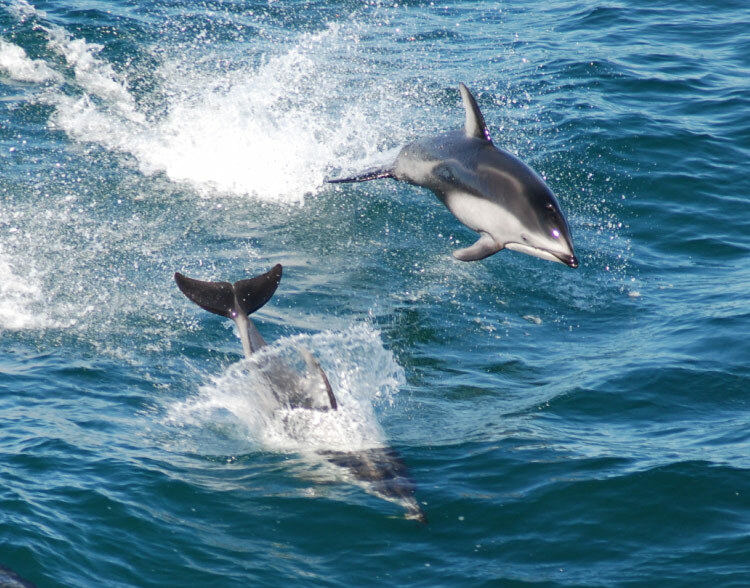 One study in Monterey Bay, California reported half of all recorded sightings of Pacific white-sided dolphins were in association with another species. In British Columbia’s inshore waters they are seen with resident killer whales, Steller sea lions, Dall’s porpoise and humpback whales, among other species. Offshore they are often reported with northern right whale dolphins, Risso’s dolphins, common dolphins and short-finned pilot whales. Pacific white-sided dolphins are preyed upon by transient (mammal-eating) killer whales and in some parts of their range by large sharks. Up until the early 1990s this species was heavily threatened by gillnet and drift net fisheries. 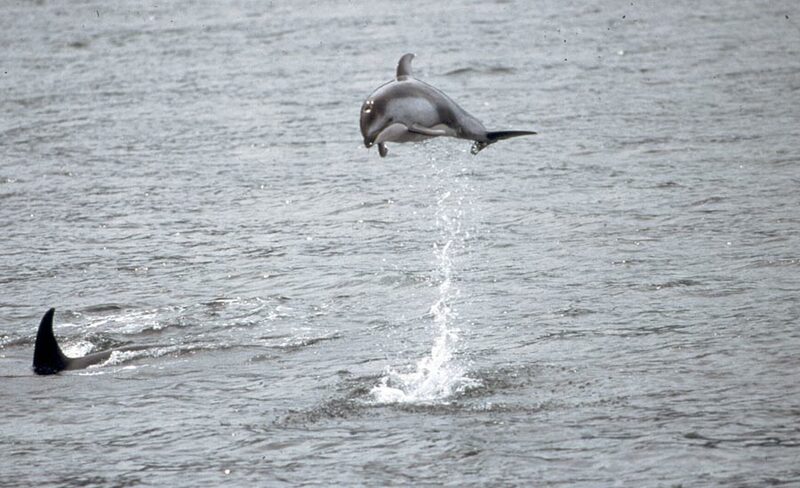 Between 49,000 and 89,000 white sided dolphins were filled in the driftnet fishery from 1978-1990. Many of these fisheries are now defunct. IUCN (World Conservation Union). 1991. Dolphins, Porpoises and Whales of the World: the IUCN Red Data Book. M. Klinowska (compiler). IUCN, Gland, Switzerland, and Cambridge, United Kingdom. viii + 429 pp.